2. Insert a key (or screwdriver) into the hole (1) and turn it to the “lock( )” position. 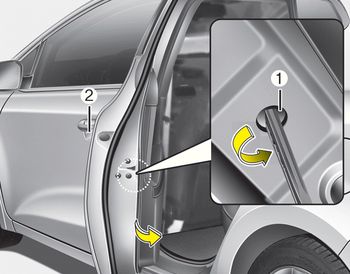 When the child safety lock is in the lock position, the rear door will not open even though the inner door handle (3) is pulled inside the vehicle. Even though the doors may be unlocked, the rear door will not open by pulling the inner door handle (3) until rear door child safety lock is unlocked.